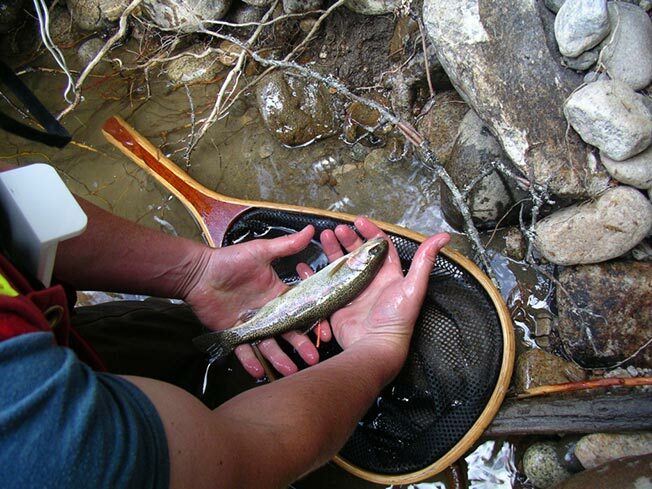 Fish—and anglers—in the Kettle River watershed are the beneficiaries of a three-year project by the environment ministry, with funding from the Habitat Conservation Trust Foundation, to restore natural flows in the river. In 2003 and 2009 there were fish kills due to low water levels, which reached historic lows during the 2009 drought, recalls environment ministry biologist Tara White, who has been heading up the project to improve the situation for the last few years. Fishery closures were put in place in the past, but efforts to improve conditions have allowed recreational fishing to re-open more recently. In fact, White says there was a six-fold increase in fish numbers after installation between 2007 and 2009 of 29 large, woody debris structures throughout the river, which provide deep water refuge for rainbow trout. Now, they’re building on that with this three-year Kettle River Streamflow Protection Plan funded by the HCTF. At issue are over-harvesting of fish, increased agricultural use and development in the valley and environmental damage such as removal of natural riparian cover and in-stream debris. The ministry has been working to improve the deteriorating condition on the Kettle River for the past two decades, while flows have declined at the critical late summer and early fall period when demand is highest from agricultural and domestic users. “This is the second year of this project, which has four main components,” White explains. First, a stock assessment is done, using snorkel gear to float in the river and count fish, then keeping data by age classes.This year fish were also tagged above the dorsal fin to refine those estimates of fish abundance. 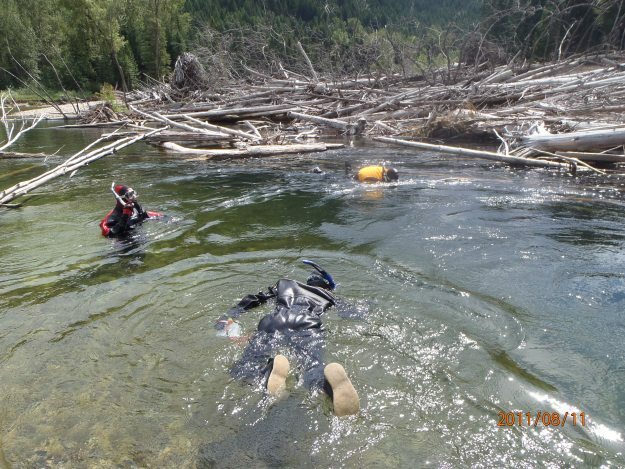 The work was done with the help of members of the Lonely Loon, Penticton and Castlegar Flyfishers clubs, and other local anglers, notes White. Second, flows and habitat are monitored using 11 stations on the Kettle, West Kettle and Granby Rivers. Changes in channel width, wetted width and flows are all measured and correlated to establish the relationship between streamflow, temperature and fish stocks. “We need to identify the thresholds where fish are adversely affected so we know when we need to close the fishery, and so we know the minimum flow requirements to prevent fish kills,” she explains. The third component is outreach and education, so she has been meeting with agricultural sectors such as the cattlemen, fruit growers and grape growers, as well as anglers and naturalists’ clubs and local government to talk about management issues and concerns. Fourth, a water use plan is underway which will include crop mapping so allocation and use is better understood, as well as information about fish and their needs and groundwater resources. White says it is gratifying to see some improvements happening. “The best part is to see the buy-in from stakeholders and volunteers. Working together, we can fix it,” she comments. “Once we lose those fish stocks we don’t know if we can ever get them back. Without HCTF funding and the club volunteers we wouldn’t have been able to embark on this project,” she adds. The HCTF exists because hunters, anglers, guides and trappers contribute money towards projects that maintain and enhance the health and biodiversity of this province’s fish and wildlife and their habitat—and toward education about those natural resources. Since 1981, it has contributed more than $130 million through surcharges on licences, with this funding administered by an independent foundation board of volunteers from around B.C.